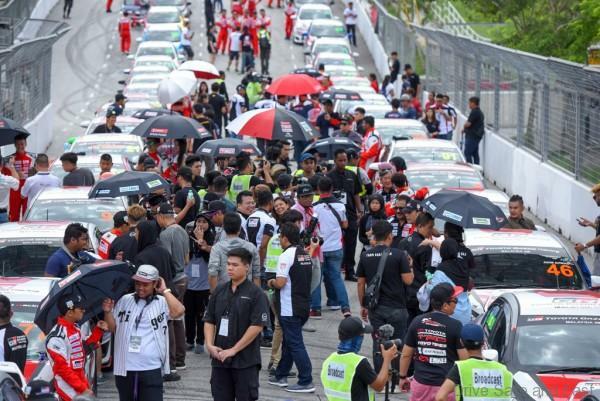 If yesterday’s opening race was calm, collected and composed, the finale and Race 2 of the Toyota Vios Challenge brought out the fiercest competitive spirit in all the racers competing in the Promotional, Sporting and Super Sporting classes. 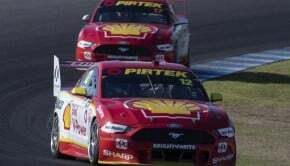 There was no holding back as racers jostled for track position and championship points ahead of what would be a four-month break in the series before the season resumes in February next year. 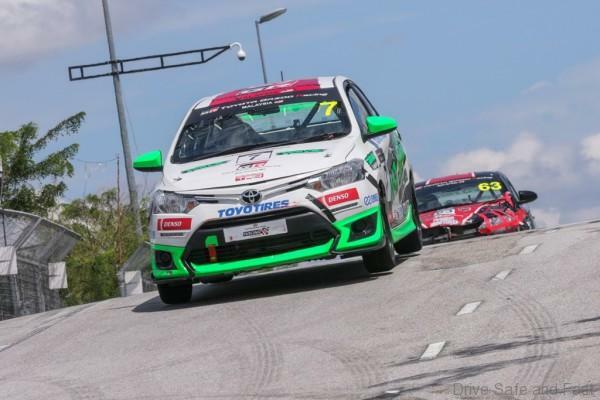 The fight for a podium finish was so intense in Round 2 of the TOYOTA GAZOO RACING Festival and the action around the 1.99km street circuit at the Malaysia Agro Exposition Park Serdang (MAEPS) in Selangor had race fans practically on the edge of their seats. You can always count on the professionals to put up a spectacular show and that was precisely what they gave race fans when race 2 had to be stopped just two corners immediately after the start of the race when Kegani Racing’s William Ho overturned after coming into contact with Telagamas Toyota’s Freddie Ng. 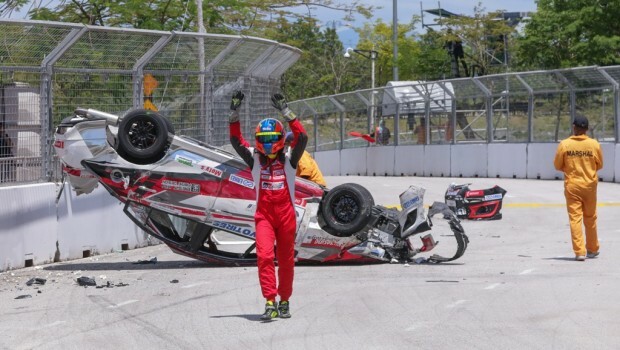 Ho waved at fans as he walked away unhurt from the incident but the race was delayed by 30 minutes as officials worked to remove the wreckage that was blocking the track and to rectify the damaged barrier. 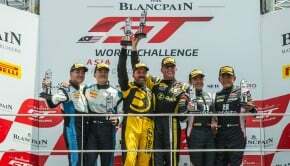 During the restart of the race, Ng who started from second on the grid made a brilliant start to get ahead of pole position man Kenny Lee, with Brendan Paul Anthony in hot pursuit in third place. Lee however, piled on the pressure trying to find a way through and eventually forced Ng into making a costly mistake two laps later when hit the concrete barrier, coincidentally at the very exact corner (Turn 2) responsible for the run-in between him and Ho. 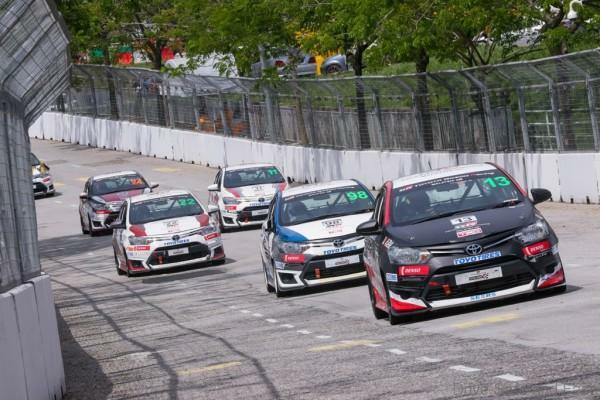 The second incident brought out the safety car for three laps with Lee promoted into the lead, Brendan in second position, Race 1’s winner Boy Wong in third position, Ser Meng Hui in fourth and Keifli Othman rounding up the top five positions. The racers in the Sporting Class were not to be outdone and put on an equally nail-biting race. At the start of the race, Team Nanoplus driver Patrick Tam shot ahead of the field from pole position to lead the race from Distinctive Model’s Clement Yeo, Prodigy Racing’s 14-year-old Hayden Haikal, ST Wangan Racing Team’s Eric Yong, Kulim Top Wheels driver Dato Ken Foo and celebrity Mohd Shukri Yahaya in sixth position. Foo, Race 1’s third place winner however, was handed a 10 second penalty for a false start offence and was eventually classified eighth despite finishing the race fourth. As Tam increased his pace at the head of the pack, Yeo had his hands full trying to fend off Hayden for six laps until the teenager made contact in an attempt to pass him for second place. Hayden did not only conceded track position to Race 1’s winner Kenneth Koh but was later served a 10-second time penalty. Koh’s third place was however, short lived when he was called into the pit to repair a damaged rear bumper resulting from the earlier contact with Hayden. 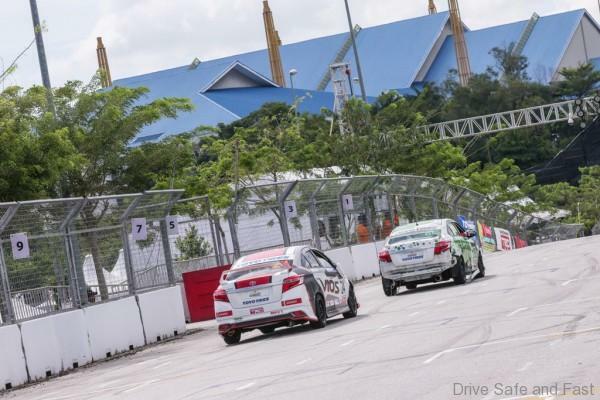 An incident involving Adzeem Eqwan Adnan in the 6th lap, brought out the safety car for five laps and when the race was back underway, Tam led from Yeo, with Yong in third place, Dannies Ng of Revo Technik Malaysia in fourth, Brendon Lim in fifth and Mohd Shukri crossing the finish line in sixth position. 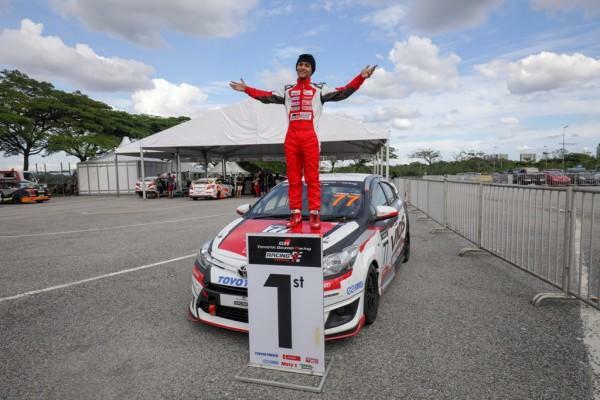 Racing in the Promotional class also brought out the best in the celebrities who put on a thrilling race for the fans, with singer Aiman Tino clinching his first race victory and second consecutive podium finish over the weekend following yesterday’s third place finish. 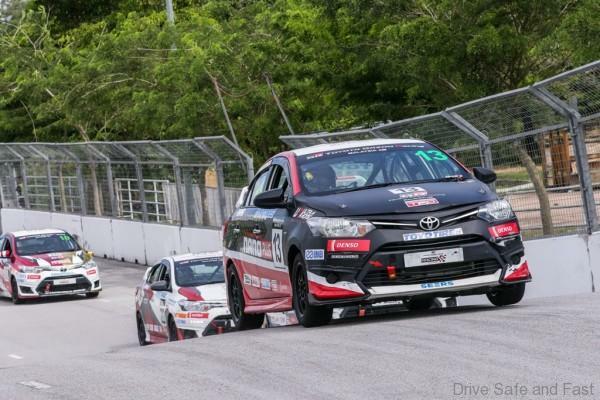 Although the 20-year-old was placed third position on the grid, he again repeated his remarkable start to lead the race into the first corner, with Akim Ahmad in close pursuit and UMW Toyota Motor Deputy Chairman Akio Takeyama in third. In chase and fourth place was Race 1’s winner Nabil Ahmad and actress Diana Danielle in fifth. 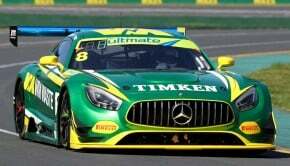 The top five positions remained unchanged for three laps until Takeyama was handed a 10-second penalty for a starting offence, and later involved in an incident when Nabil’s overtaking move sent him into the concrete barrier. Nabil crossed the finish line in third place but was subsequently served a 20-second penalty classifying him sixth. That promoted Diana into third place for her second podium finish. 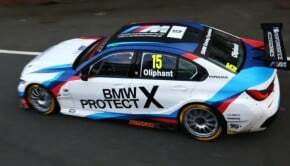 “I finished fourth in the race but I got to know that I’ve been classified as third. I really don’t know what’s going on right now and I am still in shock with the results,” said Diana. 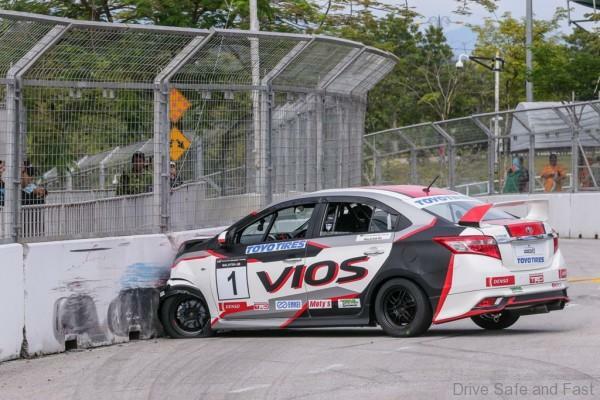 For Nabil, the incident with Takeyama was extremely difficult to digest, so much so he slowed down at Turn 2 on the very next lap with the intent on apologizing, forgetting that there was still a race going on behind him. After Kuala Terengganu in August and this weekend’s Round 2 at MAEPS, the festival will travel to the Batu Kawan Stadium in Penang in February 2019 for Round 3.